Hoffman Estates, IL -- Omron opened its new Americas headquarters in Hoffman Estates, IL, on September 3, 2014. Just 30 miles from the heart of Chicago and featuring a state-of-the-art Automation Center, Omron designed the facility to give customers access to engineering and technical resources in one centralized location. The Automation Center also serves as a university-style laboratory where customers can collaborate, test and explore solutions. Several Automation Center locations are already up and running in Japan, Europe, India, and China, Omron’s newest investment in the Americas is an advanced design with multiple working platforms including: robotics, electro-mechanical motion control, advanced sensing and safety. “We want to help customers improve their process and be more profitable. Using real-world simulations, customers can test solutions with currently available technologies or explore custom hardware and software options. With access to the engineers and technicians who develop and support the processes, customers experience a one-of-a kind collaboration that maximizes their time and efforts, so they can leave with answers to their most difficult applications.” says Matthew Trowbridge, Director of Marketing, Omron Automation & Safety. Louisville, KY -- Greater Louisville leaders announced the launch of Where Opportunity Knox today, an initiative that will connect 10,000 transitioning veterans and military spouses to jobs and to the region over the next three years. In addition to the 6,000 to 8,000 jobs available in the Greater Louisville Region, the region’s proximity to Fort Knox makes it uniquely suited to become a veteran talent magnet. Fort Knox is the headquarters for the U.S. Army’s Transition Assistance Program (TAP) where approximately 130,000 soldiers exit the Army annually, either physically or virtually. Nappanee, IN -- Ameritrans Bus, Inc., an assembler and distributor of small to mid-size transportation vehicles, announced plans today to locate its second Indiana facility here, creating up to 73 new jobs by 2016. The Elkhart-headquartered company, which is a subsidiary of Faribault, Minn.-based ABC Companies, will invest $2.17 million to lease, renovate and equip a 110,000 square-foot facility at 504 S. Oakland Ave. in Nappanee. Beginning operations this month, the company’s new facility will assemble double deck buses for United Kingdom-based bus manufacturer Alexander Dennis, which will be used throughout the United States and Canada for sightseeing and community transit. Columbia, SC -- Prysmian Group, a gloabal cable producer serving the energy and telecom industires, is expanding its manufacturing facility in Abbeville County. The company's $8.2 million investment is expected to create approximately 20 new jobs once in full operation. Prysmian, whose Abbeville facility is celebrating its 50th year of operation, is investing in a new, state-of-the-art compounding facility for medium voltage cable insulation and is adding a second vertical continuous vulcanization (VCV) line. Company officals plan to start construction this year, with production expected to begin in the second half of 2015. Prysmian's first VCV process, housed in a 373-foot tower and constructed in 2009, was the first one of its kind to produce extra-high voltage power cables in North America. Melbourne, FL -- The restructuring of the airline industry and the changes to service in the past seven years have left a void that Elite Airways is intending to fill with nonstop, point-to-point service. Elite launched its first commercial airline service on September 11, 2014, between Melbourne, Fla., and Washington Dulles International Airport (IAD). Chicago, IL -- Pam Coleman, president of Biofortis, a Merieux NutriSciences Company, has been appointed to the 2014/2015 International Food Science Certification Commission (IFSCC). The IFSCC is an independent, third-party certification body that oversees the testing, governance, and policymaking for the Certified Food Scientist (CFS) credentialing activities. The Institute of Food Technologists debuted the CFS credential in 2013 to recognize the applied scientific knowledge and skills of food scientists. The IFSCC ensures the autonomy of the CFS program and provides appropriate oversight of the certification process. Michigan City, IN -- IEDC LogoChicago Craft Bottling, LLC announced plans today to locate its first Indiana bottling facility in Michigan City, creating up to 35 new jobs by 2017. The Chicago, Illinois-based company will invest $910,000 to construct and equip a new 10,000 square-foot bottling and packaging plant. The new facility, which is expected to be operational by the end of the year, will allow the company to provide bottling and co-packing services to craft and innovative beverages, including its anchor client, Crafthouse Cocktails. Chicago Craft Bottling plans to hire for approximately 10 new positions in Indiana by early November. American Association of Port Authorities -- Harbor Maintenance Tax (HMT) funding in the Fiscal Year 2015 Energy and Water Development Appropriation must meet the WRRDA target for jobs and economic growth to ensure U.S. competitiveness in world trade. Ports play an important role in job creation and economic prosperity for every American and every constituent, even though most Congressional Districts do not themselves contain ports. State-specific benefits can be found here. Lowell, AR -- Total Quality Logistics (TQL), one of the largest freight brokerage firms in the nation, today announced it is opening a facility in Lowell, Arkansas, just outside of Rogers. The company plans to invest a quarter of a million dollars and create up to 50 new jobs. Hiring, mostly for sales positions, will begin immediately. “We’re pleased to add the state of Arkansas to our footprint. This new location will give us access to the outstanding professional talent in Northwest Arkansas,” said TQL Executive Vice President, Kerry Byrne. TQL’s sales team ranked four years in a row as one of the “50 Best Companies to Sell For” by Selling Power Magazine. TQL has a vibrant culture, celebrating successes through frequent team outings, company-wide celebrations, and team-building charitable work – all reasons why TQL was featured in Inc. magazine as one of the fastest growing private companies in America. TQL is a 10-time honoree on the Inc. 500|5000 list and recipient of numerous workplace and industry awards. Amistad Industrial Developers announced NEW DEVELOPMENT in Central Mexico!! 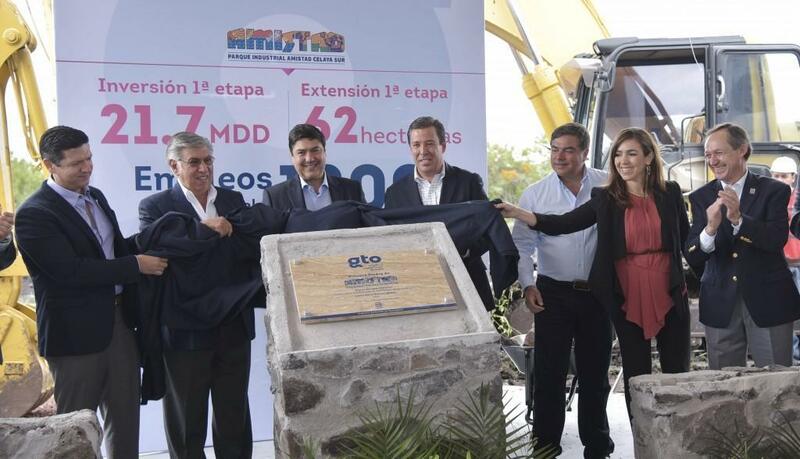 Amistad breaks ground on a 62 Hectare industrial park located in the state of Guanajuato (Mexico Bajio Region). With an investment of $21.7 million dollars this park will accommodate 15-20 new manufacturing companies in the automobile, aerospace, manufacturing and logistics industries. Strategically located 9.5 kilometers from Honda and 52 kilometers from Mazda, this industrial park will generate more than 1,200 new jobs to the area. American Association of Port Authorities -- Successful entries in the American Association of Port Authorities’ (AAPA) 2014 Environmental Improvement and Information Technology award competitions have been named following a rigorous entry and selection process. The winners in these three programs, together with the 21 ports that submitted successful entries in AAPA’s 2014 Communications Awards program (announced on June 6) will be recognized during the awards luncheon on Thursday, Nov. 13, at AAPA’s 103rd Annual Convention and Exposition in Houston, which runs Nov. 9-13 and is being hosted by the Port of Houston Authority. AAPA’s Information Technology Awards program, which began in 2002, highlights port technology accomplishments in the areas of Port Operations and Management Systems and in Improvements in Intermodal Freight Transportation. This year’s IT Awards program winner is the Port of Los Angeles, whose “Cyber Security Operations Center” entry was submitted in the Port Operations and Management Systems category. Salt Lake City, UT -- Varian Medical Systems today broke ground on new construction that will expand its current Salt Lake City manufacturing facility and allow for the consolidation of operations currently underway outside of Utah to ultimately create 1,000 new full time jobs in the state over the next 20 years.